let his heart be perfectly at peace. different women in Depression era Texas, whose lives become deeply intertwined through recording spirituals that lead the pair to bankable command performances in New York City. One woman is a recalcitrant prisoner doing hard time for murder, the other a frustrated Ivy League academic doing backbreaking field research for Library of Congress. It’s an entrancing performance by both women, ably directed by Terry Martin and Akin Babatunde (music director) to realistically portray the natural relationship that develops and emphasize their singing talents. Playwright Higgins created his show’s premise from real life experience involving folk musician Huddie William Ledbetter (known as “Leadbelly”), discovered in a Texas prison in the ‘30’s and recorded by musicologist John Lomax, a Library of Congress folksong collector. “For a couple of years, I’d toyed with the idea of writing a play about Leadbelly and John Lomax, but something kept me from doing it.” When Higgins found an African women’s song that arrived in America on slave ships and was still being sung by African descendants, he knew he had to make it a focal element of his play and created the women instead. “Amelia’s Song”, named for a Georgian woman who sang it in the 1930’s for a folk archivist, came from Sierra Leone 200 years ago, where the British ran a slave castle. The song was traditionally performed at graveside ceremonies called Tenjami (crossing the river), by women, who were responsible for birth and death rites. 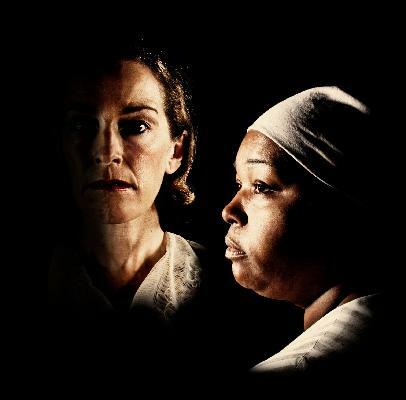 In Higgins’ play, Susannah (Sheehan), the archivist, searches hard to find a slave trade era song; but Pearl (Mikel), the slave descendant, never shares hers, instead singing it alone at the play’s end to honor the recent death of her own daughter. Higgins covers a lot of turf and time with this play (Act I is in a Texas prison, Act II in a New York apartment) and oversimplifies the details occasionally. Mikel and Sheehan find all the right reasons to develop the core relationship that make it believable and transcendent. The unglamorous, bare bones set by Christopher Pickart, realistic period costumes by Michael A. Robinson and subdued, well-tempered lighting and sound by Leann Ellis and Scott Guenther reinforce the bleakness of the Depression era while allowing the show’s music to take center stage. Sudden death commands everyone’s attention, like a firing gun. Sudden death commands everyone’s attention, like a distant drum beat. WaterTower Theatre presents Liz Mikel and Diana Sheehan in the Regional Premiere of Black Pearl Sings! May 27 through June 20 at the Addison Theatre Centre, 15650 Addison Road in Addison, Texas.